We are back again with some amazing no deposit bonuses to make your week memorable. We have a little bit of everything - there are some cool no deposit free spins and there are some exciting no deposit casino credits too for you to try out. Kick off your day with a fantastic and exclusive no deposit bonus of $35 at Rich Casino. And that is not all; we have 3 other exciting offers lined up for you. And then there is the featured article of the week to check out. We are able to bring these fantastic no deposit bonuses to you thanks to the dedication and commitment of our team of experts. They focus week after week on ensuring we are able to list out the best bonus offers for you. Now all you have to do is go through this page and click the casino whose bonus you want to use. Players who sign up with Rich Casino through our website are guaranteed a fantastic experience starting with an exclusive no deposit bonus of $35. This bonus is credited directly to your account on signing up and doesn’t require any bonus code to be activated. The bonus comes with a slightly high wagering requirement of 75x the bonus amount. Along with this you get to use the regular no deposit free spins bonus that the casino offers new players on signing up – 25 free spins on Good Girl Bad Girl. The maximum cap on withdrawing winnings earned with this bonus is $100 and there is a 20x wagering requirement. Rich casino offers a fantastic range of promotions and bonuses for all its players. Beyond the no deposit bonuses is a sensational welcome bonus that gives you unlimited match bonuses on your first 5 deposits: 200% on the first deposit, 100% on each of your second, third and fourth deposits and 175% on the fifth deposit. There are other exciting bonuses as well for existing players, including match bonuses, exciting tournaments, weekly VIP bonuses, exciting bonuses for depositing with Neosurf, cashback bonuses and more. The casino is powered by software from some of the leading casino software providers like BetSoft Gaming, Pragmatic Play, Microgaming, Rival Gaming, Habanero, Octopus Gaming, Vivo Gaming and ViG. This casino has been around for close to 20 years now - it first opened its doors to players in 1999 – and offers a secure gaming environment. It is certified for the same by McAfee and Norton. All games are conducted fairly and this casino has seals of approval from leading industry watchdogs like OnlineCasinoReports, NoDepositKings and VegasSlotsOnline. Sign up at Rich Casino and recieve a $35 No Deposit Bonus. Register an account with Casino Room to get exclusive access to 25 hot no deposit free spins. There is no bonus code needed to claim this promotion; it is credited to your account directly. The bonus comes with its own wagering requirements; go through the terms and conditions associated with this bonus carefully at the casino website to learn more about it. The no deposit bonus is just the beginning; there are a slew of other bonuses as well for you to use, starting with a superb welcome bonus of up to €2000 on your first 5 deposits. Casino Room is one of the most popular online casinos around and has been providing high quality gaming since its launch in 2005. The casino is operated by Ellmount Gaming Limited and is licensed by the Malta Gaming Authority (MGA), the United Kingdom Gambling Commission (UKGC) and also the Government of Curacao. Casino Room is powered by software from some of the top providers in the industry including the likes of NetEnt, NextGen Gaming, Evolution Gaming and others. There are more than 950 high quality games from these providers at the casino including slots, table games, live casino games and jackpots. The casino supports a range of popular banking methods including credit cards from Visa and MasterCard, e-wallets like NETeller and Skrill, prepaid cards like PaySafeCard and also Trustly. New players at Prime Slots Casino get an invaluable and exclusive no deposit bonus of 110 free spins. The free spins are available on the Big Bad Wolf slot and are credited into the player’s account the moment they register for real money play with the casino. This exclusive bonus comes with a 50x wagering requirement. The casino offers an exciting range of promotions for all its players. New players get a cool welcome bonus of 100% up to €200 on their first deposit. There are other bonuses for existing players as well, including free spins, match deposit bonuses, loyalty points and more. Prime Slots casino was launched in 2011 and is owned and operated by Prime Online Limited. It is licensed by the Malta Gaming Authority (MGA) and also the United Kingdom Gambling Commission (UKGC). The casino uses 128-bit SSL encryption and secure servers to provide a secure gaming experience. This casino has a fantastic portfolio of more than 250 high quality games mostly from NetEnt. There are also a few games from Amaya Gaming and NeoGames. All games are available in instant play mode at this casino. Players can make deposits in multiple currencies including EUR, USD, AUD, Rand, SEK, NOK, and more. Payment methods supported include Visa and MasterCard, NETeller, Skrill, EntroPay, PaySafeCard, GiroPay, ClickandBuy, fast bank transfer, Zimpler, Trustly, Euteller and others. Yeti Casino offers its new players an exciting no deposit bonus of free spins the moment they open an account for real money play at the casino. The free spins are available for use on Starburst and Joker Pro. The bonus is credited into the player’s account directly and doesn’t need a bonus code. Apart from the no deposit bonus, new players also get a superb welcome bonus package of 100% up to €/£/$333; R3333 or ?24,000 and 100 free spins on their first deposit. They can use the free spins to play Starburst or Book of Aztec. Yeti casino has been offering exciting online casino gaming experiences to players in five different languages – English, German, Norwegian, Swedish and Finnish – since its launch. The casino offers secure gaming through the use of 128-bit SSL encryption and is verified for the same by GoDaddy. It is owned and operated by L&: Europe Ltd. This casino is licensed by the Malta Gaming Authority (MGA), United Kingdom Gambling Commission (UKGC) and Spelinspektionen, the Swedish Gambling Authority. You get hundreds of exciting games at this casino from top providers including NetEnt and Amatic Industries and others. The games available include slots, table games, live casino games and jackpots. There are jackpots running into millions of Euros at this casino, including some of the biggest of them all, such as Mega Moolah, Hall of Gods, Mega Fortune, Major Millions and King Cashalot. We are never too old to enjoy some classic comic action. Combine that with a few spins on the slots and it’s a real winner in the entertainment sphere. 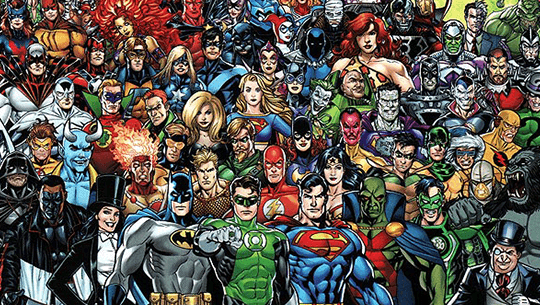 In this week’s blog we list out the best DC Comics free spins slots. Read more about it here. Play amidst your heros and spin with the best of DC with great free spins on DC themed slots!